I wanted my Halloween party to be a little different from my previous ones. I did some research on the internet and learned that the Celts, native people of Ireland, celebrate Halloween, or Samhain, like New Year's Eve. The party lasts from sundown to sunrise and is for honoring the spirits of their ancestors, rather than for fearing them. I decided this sounded like just the kind of Halloween I wanted to host: Unique, slightly eerie, but very memorable. The invitations I sent gave the location, date and time and also asked them to come in costume, but wear comfortable shoes and bring something with a "harvest" theme for the pot luck and a small pumpkin to carve. One of the things I needed was a fire. Halloween marked the Celtic New Year, and they ritually cleansed themselves of negativity by jumping through a fire. I couldn't very well build a bonfire in my backyard, but I could dig a fire pit and create a decent campfire for us to jump over. I carefully removed a patch of grass from the center of the yard and dug a small pit then ringed it with rocks I took from the river bed. I bought a half cord of wood and put it in the pit. For safety, I filled a five gallon bucket with water and placed it nearby. I rented a canopy tent to set over the food table. I set up a camping tent for the guests to go inside for their individual séances. I had hired a medium for the party who would contact one deceased relative for each of the guests. The camp tent was lit by Jack-o-lantern and filled with pillows from my couches covered by remnants of velveteen I picked up at the fabric store. I covered the food table with a fall leaf print table cloth. I set out a home-made pumpkin pie, a crock pot of hot, spiced apple cider and vegetable soup. I also had plenty of red wine. From my research I also learned how to make cloved fruit and set out a bowl of apples and pears in which I stuck pieces of clove. The pagan tradition was, if you found a clove, you had to pass from your mouth to another person's mouth without using your hands. That person had to pass it on to someone else and so on. The first activity after the guests arrived was pumpkin carving. A few guests started throwing pumpkin goo and started a goo fight! I took some great pictures of people throwing pumpkin mush. All the seeds were collected and placed on cookie sheets and baked in the oven. There were tons of seeds and we munched on them all night along with the other delicious pot luck dishes brought by the guests. I had prepared some booklets so we could all stand around the fire after it was lit and chant some traditional pagan chants for the new year. The fire jump was the highlight of the party. We formed a circle around the fire and chanted our favorite songs (because none of us knew any pagan chants). Some people had to remove part of their costumes, but everyone took turns running toward the flames. Some bellowed or shouted as they jumped and every body clapped and cheered when they landed safely on the other side. Some of the guests intered the séance tent with a snicker, but many came out with looks of amazement at the way the medium channeled the spirits of their deceased relative. My friend Jaimie said he didn't think he would take the medium seriously, but after just a few minutes he knew he was really talking to his grandmother's spirit because she always called him Shatzi. He said she told him she wasn't upset he hadn't been there when she died and she was also proud he was about to graduate from law school. There was no way I could have coached the medium ahead of time, because I didn't know Jaimie's grandmother called him by a nickname. People sat around the fire singing and and dancing and even passing cloves, all through the night. It was as if we were transported back to time when life was simpler and people's sense of family also extended to their friends as well as relatives. I think everyone went away with a lot of new memories and stronger friendships as well as a lot of pumpkin seeds. 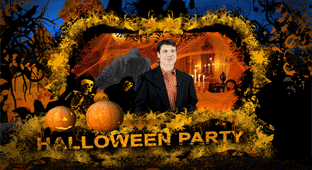 The party was such a success, I think I will have a pagan Halloween party next year.